Google recently started focusing on micro-moments of need during which brands have opportunities to provide value to their customers. Those include "show me how," "is it worth it?" and "I want to go" moments. After all, consumer events, queries, and movements are getting more subtle and fragmented. 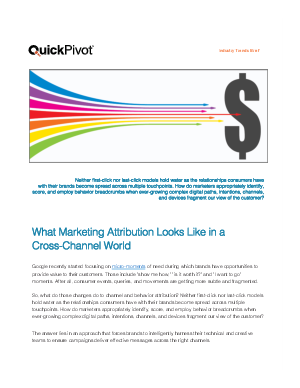 So, what do those changes do to channel and behavior attribution? Neither first-click nor last-click models hold water as the relationships consumers have with their brands become spread across multiple touchpoints. How do marketers appropriately identify, score, and employ behavior breadcrumbs when ever-growing complex digital paths, intentions, channels, and devices fragment our view of the customer? The answer lies in an approach that forces brands to intelligently harness their technical and creative teams to ensure campaigns deliver effective messages across the right channels.